Michel Tuffery is a New Zealand based artist of Samoan, Rarotongan and Ma’ohi Tahitian heritage. Born in Wellington he studied at the School of Fine Arts at Otago Polytechnic in 1989 an was awarded a Diploma in Fine Arts (honours) and went on to undertake further study at the University of Manoa in Hawai‘i. In 1993, he participated in the 1st Asia Pacific Triennial, at Queensland Art Gallery and in 2008, he received the New Zealand Order of Merit for services to the arts. He has undertaken numerous residencies throughout the USA, Germany, France, United Kingdom, Asia, India, Australia, Aotearoa and the Pacific. Michel’s art practice is broad and spans printmaking, sculpture, performance art, painting and design, new media and animation. 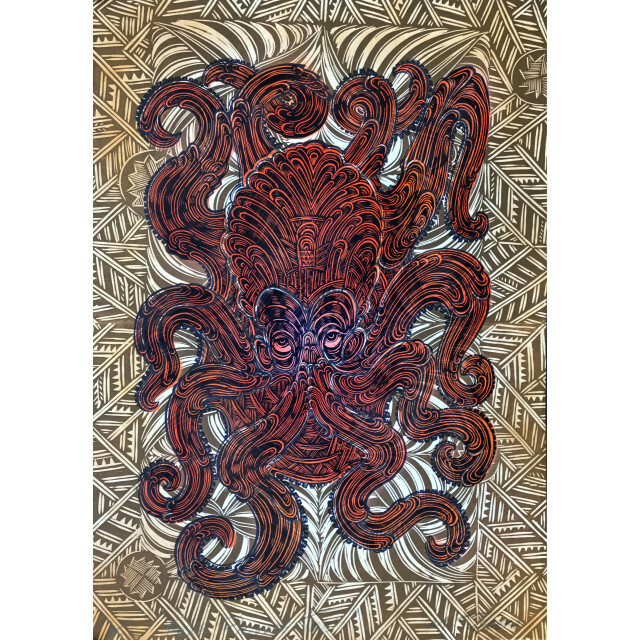 His work deeply reflects his pacific heritage and engages with his relationship to the region, its people and the environment. Reflected in his motifs and materials are both traditional and contemporary markers of culture, celebrating and challenging us in how we view these.